Mridanga Meditations - Seminar REGISTER NOW! ~ The Toronto Hare Krishna Temple! 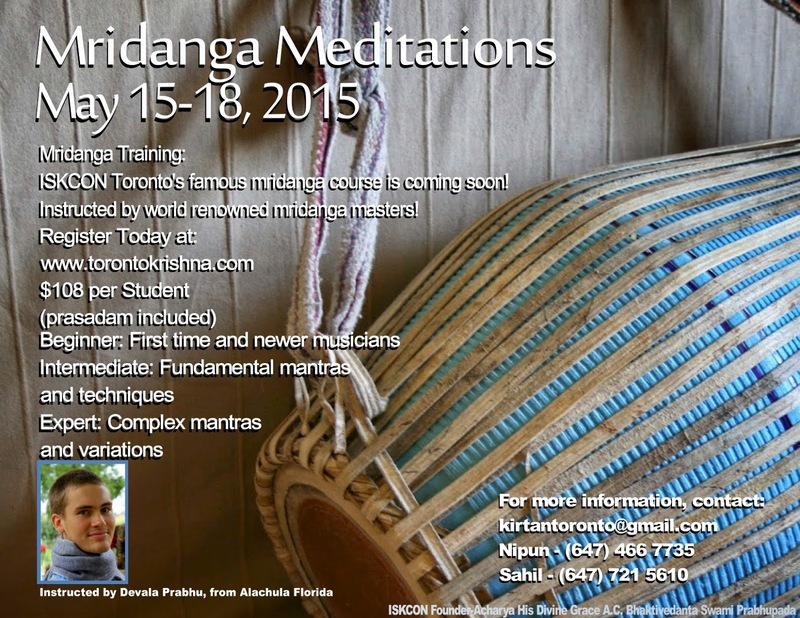 Mridanga Meditations - Seminar REGISTER NOW! The Toronto Hare Krishna Temple is very excited to announce our next Mridanga course! With great success and feedback on our first Mridanga course in January, and a huge demand for another one, it's finally here! This mridanga course is for anyone and everyone - all ages and mridanga playing levels welcome! The course will be taking place over the long weekend of May 15th to 18th, 2015. The course will be taught by Devala Prabhu, a young, second-generation Hare Krishna youth from Alachua Florida who is a masterful mridanga player. He will be facilitating the course at the temple and everyone is invited.